Just over 70 kms of groomed runs provide skiers and snowboarders with descents of varying difficulties, from a height of 11,253 feet above sea level to the base at an elevation of 7,349 feet. The vertical drop of the lift-served, in-bounds area of Las Leñas ski resort is a hefty 4,035 feet, with gradients ranking from 12% to 53%. 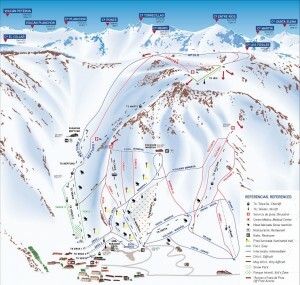 The lift serviced area is sufficiently vast to cater to both intermediates and to a lesser extent pure novices. There is no doubt the field favours middle experience to advanced skiers and snowboarders, with a plethora of red and black runs and massive swathes of easy access back-country. By some accounts, in excess of 500,000 sq hectares of wild back-country is readily accessible from the top and west of the Marte and back routes. Farther afield you can actually cross country a mountain ridge top and then descend to the road that leads into Leñas about 8kms down the valley. Built in 1983, Las Leñas has the most modern lift system in South America, yet its lifts are a little slower and somewhat old-fashioned compared to US & European infrastructure. 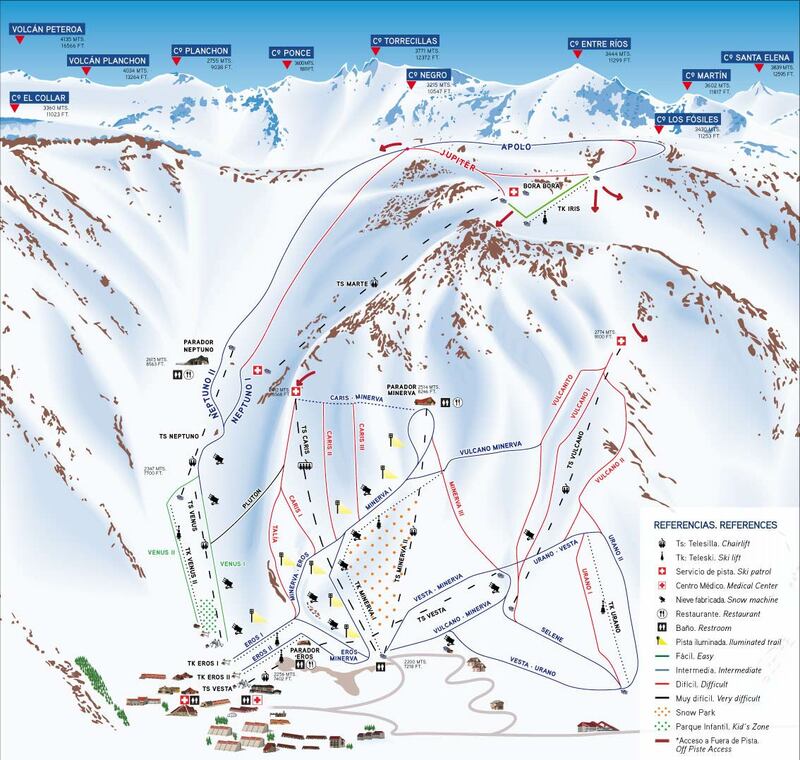 Lift lines are all but non existent at Las Leñas; 12 ski lifts boast a total uphill capacity of 9200 skiers per hour, while only 3500 beds are available at the resort. The ski lifts are named after Roman and Greek Gods: Venus, Eros, Minerva, Vesta, Vulcano, Jupiter, Apolo, Neptuno, Mercurio, Caris, Selene, Juno, Iris, Marte, Urano, and Cenidor. Lifts run nonstop from 8.30am to 5pm daily. Time: Atlantic; 1 Hour ahead of New York. Tourist Visa: Foreigners do not require a visa to visit Argentina. Currency: 1 U$S = $3.90 Argentinean Pesos. Language Spoken: Castellano (Spanish), little English spoken. Las Leñas, is located in the southern part of Mendoza state, 130 miles from San Rafael and 280 miles from the city of Mendoza. From Buenos Aires, the 1200 Km journey is completed in about 11 hours and we suggest taking Route 7 to Junín and then route 188 up to Gral. Alvear, then route 143 to San Rafael and from there route 144 up to El Sosneado. Finally, take route 222 to Las Leñas Valley, 20 km after Los Molles. If you are staying in apartments and want to save money, we highly recommend arriving internationally in Mendoza (MDZ) instead of Buenos Aires (EZE). Depending on the size of your group, we can arrange different sized private van transfers from San Rafael to Las Lenas.